This book is Carson's policy book written in preparation for the 2016 presidential primary (released in May 2014). Carson has written several other books about his medical history and personal history. 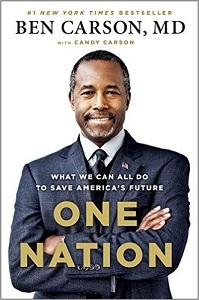 This is not even Carson's first political book -- he wrote America the Beautiful in 2012 -- but that was more of a personal introduction whereas this newer book is heavier on policy. Carson organizes each chapter by starting with a Biblical quotation (usually from the Book of Proverbs, which is Carson's daily reading, he says on p. 140), and ends with "Action Steps," which feel more like Sunday School homework. Elected to office: Carson has never been elected. Examples of others not previously elected: Dwight Eisenhower was never elected until running for President; Arnold Schwarzenegger was never elected until running for Governor. Appointed to office: Carson has never been appointed to public office. Lawyer: Carson is an M.D. and points out that five signers of the Declaration of Independence also were (p. xvii and p. 142). Examples of elected MD's: Senator Rand Paul (R, KY); Governor Howard Dean (D, VT); but no presidents. Military success : Carson has no military experience. Examples of candidates running for president based on their military experience: Senator Jim Webb (Former secretary of the Navy); Senator Lindsey Graham (Veteran and member of Armed Services Committee). Political organizer : Carson organized the Carson Scholars Fund. Medical innovator: Carson was not just a successful brain surgeon, but considers himself a scientific innovator (which is the topic of the movie about Carson, "Gifted Hands") -- focusing on techniques to separate cponjoined twins. Rand Paul and Howard Dean, although also medical doctors, never made such a claim. Role model: This is the title of Chapter 15 of this book, and is Carson's claim to voter support. He had humble origins; found reading and found God; then became successful. His claim to being a role model is based on morality and success, as well as innovativeness and as an educator. Bottom line: Ben Carson's followers are fervent -- mostly in the Tea Party movement -- and this book demonstrates what they see in him, or at least what he thinks they see in him. He is the least "qualified" of the major presidential candidates by traditional qualifications, but in 2016 that seems like a positive attribute! Old Testament: Life begins at conception. Ben Carson: When you educate a man, you liberate a man. Ben Carson: College grads today fail a 6th-grade test from the 1800s. Ben Carson: America on same bad path as ancient Rome, but we can fix it. Barack Obama: OpEd: Passing ObamaCare with no GOP caused long-term rancor. Ben Carson: PC police make us afraid to say "Merry Christmas". Ben Carson: Five doctors signed Declaration; we solve problems. Ben Carson: Our flag symbolizes one nation, under God, indivisible. Ben Carson: God says tithe at 10%; no triple tithe for bumper crops. Old Testament: Those who help the poor honor their Maker.